My brother's wife was lucky enough to draw on this same hunt and so he shared the story with me. Here is his story about his wife's first hunt, ever! 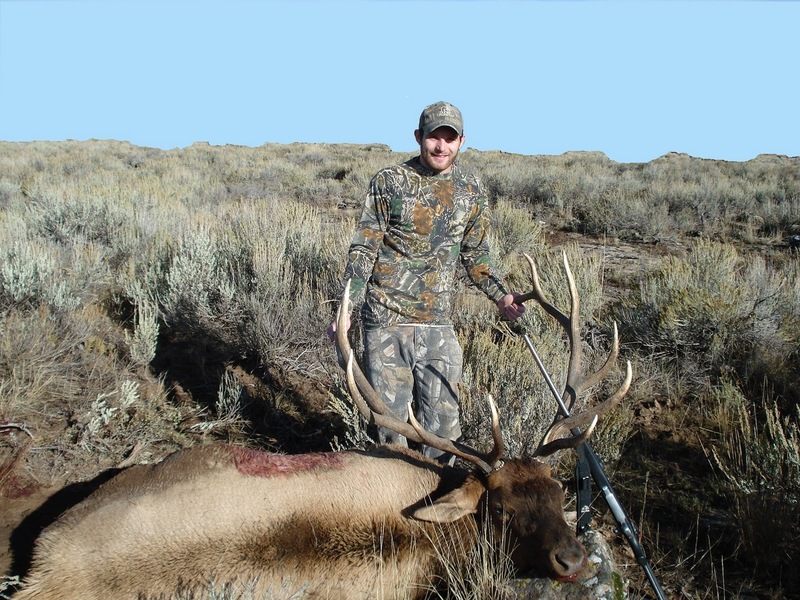 You have just read about my father's experience taking a wonderful bull on a very special hunt, and then my brother following in his footsteps and taking another wonderful bull elk with the same rifle 14 years later. 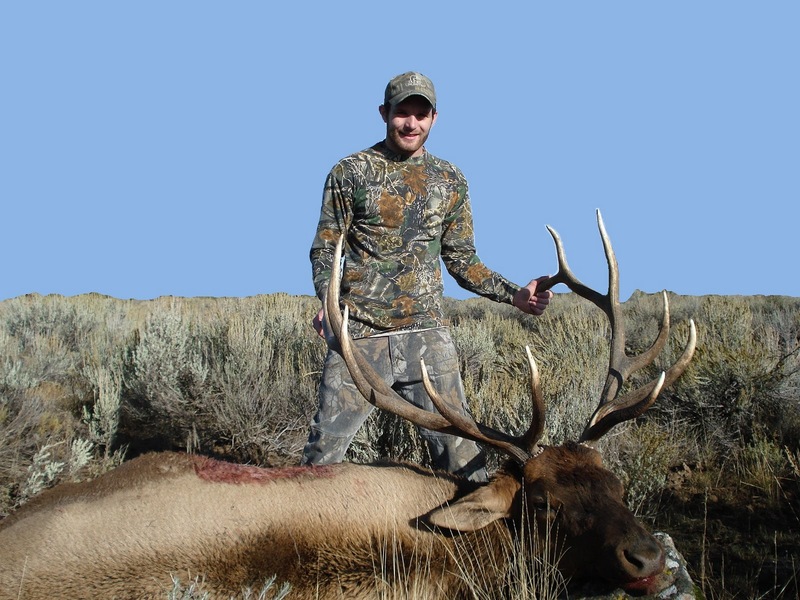 I wish I could add another part to this story about me taking a once in a lifetime bull, but instead i get to share an almost better story about how my wife was luck enough to take an amazing bull elk on the same hunt a few years after my brother took his elk. My wife grew up far from being the outdoorsy type, but when we met each other she took to it like white on rice! After being married two years I had finally talked her into the idea of shooting an animal so she took her hunters education classes, got her license, and we put her in on some hunts. Idaho does not have a point system or anything so when you draw on a hunt. Idaho does not have a point system or anything so when you draw on a hunt it is nothing but pure randomness and luck. Well both of those things were what my wife had apparently because she drew out on the big bull hunt that I had been putting in on for over 15 years. She was pretty excited when she realized how lucky she was to get the hunt, but I think I'm safe to say that she did not realize how lucky she really was to have such an amazing opportunity. We started the hunt on opening morning and I will have to admit, I felt the pressure from my dad and my brother both bagging monster bulls on the opening day when they drew on this hunt. We worked hard to get Sarah around some elk, but with it being as warm as it was the elk were not in the full rut like we had hoped. After hiking plenty of miles and scouting we finally saw some elk far in the distance, but decided to let them be and hit it hard in the morning with a new game plan. The next morning we hunted the same area, but came in from another side. The first thing we decide to do was get up on a high spot that we knew about and glass for the herd of elk we had seen the day before. We hiked in while it was still dark and sat up on the glassing point while the sun slowly came up. I realized then more than ever that I needed to forget about getting my wife an opportunity to shott a monster and just make sure she enjoyed her first hunting experience. We stood around and rested while we watched the sun come up. Sarah took some pictures of the sunrise with the Tetons in the Tetons in the background. We heard a few coyotes in the distance yipping at the morning, and then we heard the sound we were hoping for. . . just faintly we could hear a bull elk in the distance, bugle at the morning sun. My wife's face lit up with excitement and she couldn't believe that she had just heard her first bull elk bugle. We soon set off after the elk we had just heard, and realized we were cutting it close with the time we had killed while enjoying the sunrise. We hiked and hiked but never heard the bull again. When we got to where we thought the bugle had come from, sure enough we saw some elk heading upt he edge of a ravine. We rushed to get ahead of them and get positioned to spot a bull elk. I told my wife that if it had horns at all she could shoot it. With this not only being the first bull elk she would kill, it would also be her first kill period! She was super nervous, but got positioned and waited while the elk slowly fed our way. Shortly, a bull elk grazed into view and presented a shot. My wife who had practiced plenty before she had come on this hunt, placed her Salvage 30-06 in her shooting sticks to steady her shot and slowly squeezed off the trigger . . to both of our surprise, after the shot the elk just stopped in its tracks and looked in our direction. . . Sarah quickly loaded and said, "I'm wiggling too bad!" I got behind her and started talking to her to help calm her nerves, slowing her breathing, just watching the elk through her scope, and waiting until she was ready before she took another shot. I tell you what, somebody upstairs definitely wanted my wife to have a good experience because that elk stood there at 300 yards just looking in our direction wondering where that last shot had come from. Right when I was about to open my mouth and try to help my wife with her nerves, BOOM, she took another shot. This time the elk jumped and started to sprint off. This elk didn't even make it 30 yards before it stopped dead in its tracks and fell over! My wife, being the tiny little thing that she is, just laid the smack down on a nice eastern Idaho bull elk. She just started asking me, "Did I hit it? Did it go down? I think I got it didn't I?" She couldn't even believe what she just saw with her own eyes. We rushed over and saw her trophy she had just downed. She was grinning from ear to ear, and couldn't believe what she had just done. She said she never would have thought in her wildest dreams that she would have turned out to be a hunter, and be sitting by a huge bull elk that she herself had just shot. I would have to say; as much as I have always wanted the opportunity to take a big bull elk, I am just as happy if not more to have seen my wife turn into the hunter that she is, and watch her take a monster bull elk. She has by far put me to shame the last few years with her hunting luck, but I'm just proud that I found a girl like her! 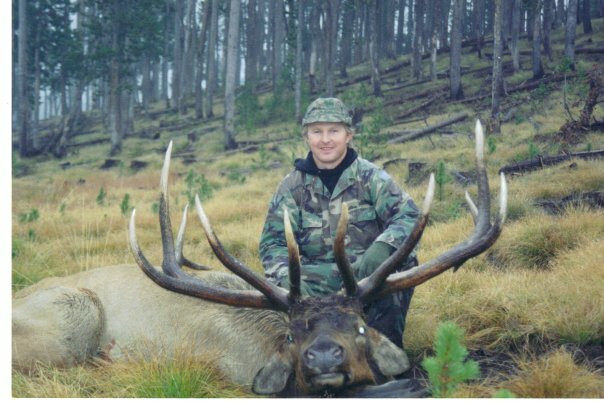 When my dad drew on his elk hunt and harvested his big bull I was 10 years old. I had applied several times for that same elk hunt. Finally, 14 years after my dad bagged his bull, I drew out on the same hunt. I had to call and read the hunt number to my dad and he couldn't believe it. I was lucky enough to be able to draw out on this hunt and just like that..... the countdown was on. Unfortunately during archery season I was busy with college, work, and providing for my family that I wasn't able to get out very much at all. Luckily my dad was "willing" to go scout the area we were planning to hunt. I was nervous that my dad was going to shoot some big bull in that unit and by the time I got out to hunt, the elk would have moved out of the unit. My dad told me not to worry that he would save some elk for me to shoot. He spent a lot of September "scouting" for elk. He had several encounters with some very nice bulls and got busted by several cows. He would come home and tell me all these stories and pictures of some nice bulls, but that wouldn't help speed up time. This is a spot where the elk tore up the ground to the dirt. Finally October 1st, 2007 had arrived and I remember not sleeping very much the night before. We left my dad's house around 4:00 am and I was overly excited. I had asked my dad if I could use his Ruger 300 Win Mag on this hunt and you should have seen my old man light up. I think he liked the idea. On the way to our spot we began talking about what size of elk I was willing to shoot. I joked around and told him that I was going to hold out fo one bigger than his, but in reality I would anything bigger than a spike. Considering I have never shot an elk in my life I wasn't going to be too picky. We arrived and began unloading our gear on the crisp, clear October morning. We began our hike up to the bottom of the first canyon we would be going up and had walked about a hundred yards and we heard a cow elk of to our right. We paused thinking that we had just been busted by a stray cow. But just then of to our left up the canyon a ways we heard another cow. Luckily the breeze was in our favor and they didn't spook as we sat there and listed to them walk up the canyon. We waited for a while until they were ahead of us a ways and decided to cross over behind them and try to get ahead of them. The wind changes directions at daybreak and usually blows up the canyon so we hoped ot get ahead of the heard before the wind decided to change. We hiked a good 45 minutes to a big fir tree where we decided to wait until daybreak. My dad decided to chime off a bugle just to see if anything would answer and sure enough a bull answered down below us. Shortly after that one bugled back to him off to our left and before that one finished there was one off to our right down even lower. I couldn't believe it. This was the most action I have heard from elk in a long time. We had planned it just right as the wind changed directions and was blowing right up the canyon. As we glassed and listened to the elk, we started noticing that the elk were moving back down the canyon. We put the move on to see if we could get a peak at the elk and where they were headed. About 600 yards away we noticed a herd of elk with two bulls that looked pretty good and a few satellite bulls. We noticed one elk had a unique rack that almost looked like a caribou with long fronts and pal mated tops. He didn't have much in between. I thought this bull was awesome and we decided to put the sneak on. We moved about a hundred yards when we noticed the elk taking off across the canyon. We busted it over to the edge of the canyon and decided to cross over to the next ridge. So down one side and up the other to get in place. We glassed and glassed looking for the elk. Nothing. My dad bugled and a bull answered about 200 yards below us, then another answer. We knew they were just below us again. Everything was perfect. The wind was in our favor, we were above the elk and they were coming our way. We started to close the distance to get into place and just then there were two cow elk standing just 50 yards in front of us and had us pegged. The stare down was on. We sat there for what felt like 30 minutes until they spooked. We knew they were going to head back across the canyon so we busted it over to the edge and sure enough there were a herd of cows crossing the canyon below us and up the other side. So I got into position and put the ole 300 Win Mag on the first elk and watched them as they single filed out of the trees and up the other side of the canyon. I hear my dad say, "there's a five point coming out" and I thought that this was it, this is the bull I'm going to take. As I watched him walk out and I stared him down in the scope I was just about to pull the trigger when my dad said,"here comes a six point and he is far bigger than that five point". That's all it took. I pulled off the five and searched for the six. Just as he was heading up the other side the cows on top paused and stopped. This caused the bull to stop on the uphill side of the canyon, broadside. I remember my dad asking me, "Is he big enough?" Just as he finished asking the question you could hear the BOOM of the 300 Win Mag bellow through the canyon. I remember seeing the bull hunch and started making his way up the canyon. I reloaded, steadied the crosshairs, and just as he topped the canyon I squeezed the trigger. This time the bull staggered and fell over. I couldn't believe it. I had just shot my first bull elk. I remember shaking with excitement and I could barely talk. We looked at the time and it was 8:30 a.m.
We made our way across the canyon one last time but this time we made much better time. I walked up and put my hands on my first Bull Elk. He was everything I wanted and then some. We took pictures, skinned, and boned the elk which was a mere half mile away from the pickup. I shot my bull on October 1st 2007 at 8:30 a.m. with my dad's Ruger 300 Win Mag. My dad shot his big bull on October 1st 1994 at 9:30 a.m. with the same rifle. It was definitely one of the most memorable and rewarding hunts I have ever been on. My bull ended up scoring 298 and my dads was a staggering 358. 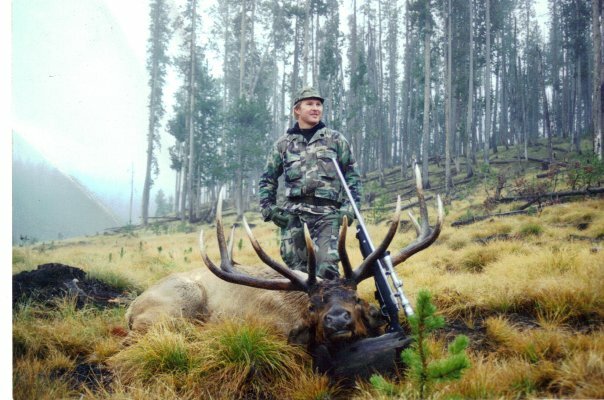 But in my book there wasn't anything better than having my dad let me use his rifle to harvest my first bull elk. Back in 1994, I drew a controlled hunt tag for a bull elk hunt in an area where I grew up hunting. However, this was not any average controlled hunt tag. 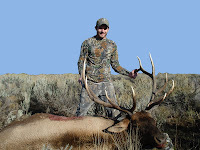 This was a new hunt the Idaho Fish and Game had just offered. It was a rifle hunt for an antlered elk that ran from October 1st through October 9th. This was after Archery season closed and before any general rifle hunts started in the area. There were only 5 tags offered and I was lucky and drew one of the tags. With a small number of tags and plenty of hunter applications, I was feeling exceptionally lucky. This particular tag is an elk hunter’s dream. The elk are usually just going nuts with the rut during this time. No other hunts are taking place during this week, except this one. The rut is on and the bulls are chasing the cows like crazy. I was excited for the chance at a big bull, but really just wanted to harvest an elk. I had never shot a big bull and this might be my chance? I had not convinced myself on holding off and shooting only a big bull. I have always hunted to get meat for the freezer and the horns are a nice bonus. I told myself I might hold off I might not? We will have to wait and see when the opportunity presents itself? When opening day finally came around, I was just as excited as a kid on Christmas morning. I headed out at 4:00 am with two of my friends Kendall and Vail. Kendall was going to do the bugling and Vail was there with the video camera to catch the event on film. It was a typical cold, foggy Idaho October morning. We found ourselves parking the truck about an hour and a half before daylight at an old logging road gated by the forest service for foot traffic only. We waited a few minutes and then rolled down the window to listen if any elk were close and bugling? Sure enough, the elk were bugling and just at the top of the ridge above where we were parked. We knew we had over an hour before it would be light enough to shoot and the elk were only about a ten minute walk from the truck, so we kicked back and listened to the sweet Rocky Mountain music of the elk bugling. As we waited, we ended up falling asleep in the truck. We suddenly all came to an immediate alertness as we were awakened by the howling of a large coyote that had sat himself down in the middle of the logging road 10 yards in front of our truck. We were woken up by one of nature’s alarm clocks right on time. We quickly grabbed our gear and headed out on our search for the bugling bulls. My main hope was to bag an elk to have venison in the freezer. My friends on the other hand were in search of a trophy. They had warned me that they would tackle me if needed to keep me from shooting a “small” bull. The elk had moved off farther than expected during the wait for daylight. As we reached the top of the ridge, Kendall bugled hoping for a close response, but got nothing. We continued to cow call and finally we could hear something walking through the grass towards us. Was this the big bull sneaking in? We set up for a shot and continued to cow call. We were sitting just inside the edge of the trees looking out into a clear cut. As the sound got closer we caught a glimpse of a couple of antler tips above the grass coming over a slight hill towards us. The elk took a few more steps and stopped. Then we realized why we only saw two antler tips, it was a young spike elk. This explained the silence, yet interest in the cow calls. I raised my rifle and took aim at the spike. I then heard a voice from behind me saying "Don’t you dare shoot him, or you are walking home!" I kept aiming, picturing the great venison steaks that would come from that fat spike. Again the voice sounded, "Don’t do it!" I was eager to pull the trigger knowing that would be some great meat for the freezer. Just then there was a bugle off in the distance that broke the concentration. Kendall said "He sounds big!" That was enough to convince me to hold off for now. I lowered my sights and we headed off in the direction of the elk bugle. We followed the elk sign and bugles for over a mile never closing the distance. The elk were on a steady pace headed straight away from us. The bugling stopped and the elk went silent. The elk activity was slower than we expected. We kept following the old logging roads snaking through the numerous clear cuts. After a few miles of hiking and bugling, I really started to second guess my decision to not take that spike. We made a turn on another old logging road that headed back in the direction we had come from, figuring we would work our way back to the truck. Just after we started down the road we heard a faint bugle off in the distance. It was in the direction we were headed so we sped up the walk. We came up on a slight hill overlooking a large clear cut and decided to stop and bugle. Kendall ripped off a bugle and before he could even finish the bull answered! He was in the thick pine trees on the other side of the clear cut. We all started searching the trees with are binoculars. Soon we saw elk moving through the trees. They were slowly headed for the clear cut. As we watched we could see several cows. We watched as they worked through the trees and stopped at the edge of the trees looking out into the clear cut. No sign of the bull. Then the cows took off across the clear cut on a dead run as if the stop light had turned from red to green. That is when the bull bugled again. All our binoculars moved from the cows towards the bugle. There he was! He had just come over the top of the small ridge and was headed down the wooded hillside towards the clear cut following the cows. I could not believe my eyes! He was slower coming through the trees then the cows, but I soon saw why. He had to weave his way through the trees tipping his huge 6 point rack from side to side. I immediately dropped my binoculars and started watching the bull through the scope on my Ruger 300 Win Mag. I couldn’t believe what I was seeing come through the trees. It was like a dream watching this majestic bull elk tip his huge head and antlers from side to side just to get through the trees. This did not help my nerves at all. I spoke first this time, "I am taking him!" Then Kendall and Vail both responded at the same time, "Take him!" I leaned against a small tree to steady myself and watched as the bull approached the edge of the clear cut and stop 300 yards away. He was angling towards me slightly and didn’t present a clear shot. My heart sunk when, just like the cows he bolted and headed across the clear cut! I followed the bull in my scope as he headed into the clearing. He then slowed as he reached the middle of the clearing. That was all I needed as I squeezed the trigger and the 300 boomed! The bull stumbled, but kept moving. I re-positioned the crosshairs and squeezed again. This time he went down. I started whooping and hollering and jumping up and down. After all the high fives were done, Kendall just looked at me and said, "Good thing you didn’t take that spike!" As we walked up to the elk I was amazed at how big the bull was! It was by far the largest elk I had ever shot. We took lots of photos and began the job of skinning and preparing the elk so we could pack it out. On the pack out we realized how far we had walked in. It was well over four miles back to the pickup. The bull ended up gross scoring 358 B&C. It was October 1st 1994 at 9:30 am when I shot by bull. I had plans to hit the woods this past Saturday but my brother, dad, and my cousin convinced me to go ice fishing instead. I was dying because I had been seeing a couple good bucks in this new area I wanted to hunt, but I was glad I decided to go fishing. I thought if nothing else it was a great opportunity to spend some time with family. We were fishing on Henry's Lake which is just over an hour drive but well worth the trip. The temperature was suppose to be well below 0 degrees and I was nervous it was going to be too cold to be enjoyable. Boy was I wrong! When we pulled in and checked the temperature according to the vehicle it was a blistering 11 degrees. This was actually good news considering it was going to be well below 0 degrees. We ventured out onto the frozen lake and began drilling some holes. Watching the sunrise on a calm winter morning was pure bliss. It's funny how you can be sitting in freezing cold weather, all bundled up, and being happy. Now there was only one way that was going to make this any better. That was to be catching some fish. My dad and brother have been ice fishing quiet a bit this year and they had seen a contraption that helped them hook the fish. You are allowed 5 poles per person here in Idaho so they thought this was a genius idea. So instead of buying them they decided they would try and make some themselves, you know, true DIY style. They came up with a prototype, tested it out, and it worked great. They just used a mousetrap, wood, and some pvc pipe. It works great! Once a fish nibbles on the bait, the tension sets the mousetrap causing the rod tip to flip up and hook the fish. The day started out slowly but that began to change pretty quick. This lake has been known to produce some giants. I know because I have seen some monsters taken. During the summer, my brother bagged himself a 10.5 pound hybrid, and a couple years ago my wife bagged a giant 14 pound hybrid. This was her first time fishing on this lake and of course she had to show me how it was done. My brother started out by hooking a couple nice brook trout to start off the day. Then it was my turn. I sat there jigging and having a conversation and BAM I got a bite. I reeled it in and pulled my biggest brook trout in weighing in at a whopping 3 lbs! I was so excited. This was a great way to start the day. I quickly took some pictures and baited my hook to start jigging again. At this point I can't remember if it was cold or not. Then as I was sitting there jigging my pole in hopes of getting another bite, one of the contraptions went off behind me. As I turned to see, the pole was bouncing up and down frantically. I quickly got over to the hole and lifted the pole and sure enough the fish on the other end was hooked. This one had a little more fight then the others. I was reeling in the fish but he continued to fight back. I could tell this one had a little more weight behind it. I would reel him in and he'd take out some more line. It was a battle between him and I. Just then I caught a glimpse of his tail near the ice and I managed to mumble something like "this is a little bigger fish guys". So my brother and dad came over and huddled around to help grab the fish. He got up close to the hole and I had some trouble getting his head to start coming up and we just sat there saying to ourselves that this is a nice fish. Then he gave us the opportunity we needed as he started coming through the ice and my brother reached down and pulled him on up. I couldn't believe my eyes! I had just caught my biggest fish I have caught. I was pumped. I was like a little kid and had a grin the rest of the day. We had such a great day, between the 4 of us we ended up catching 30 total fish. The limit is 2 fish per person so we had to really decide which ones to keep and which ones to let go. Needless to say this one went home with us. It was a beautiful day and will be a trip I will always remember! This was a fantastic trip and the plan was to go hunting that evening but when you are busy catching fish like this, you kind of lose track of time. It was a blast and I am grateful to live in an area where I can actually juggle the idea of catching fish like this in the morning and chase deer in the evening!